T.S. Eliot is known to have once said, "Immature poets imitate; mature poets steal; bad poets deface what they take, and good poets make it into something better, or at least something different." The good people at Gearbox Software must love them some T.S. 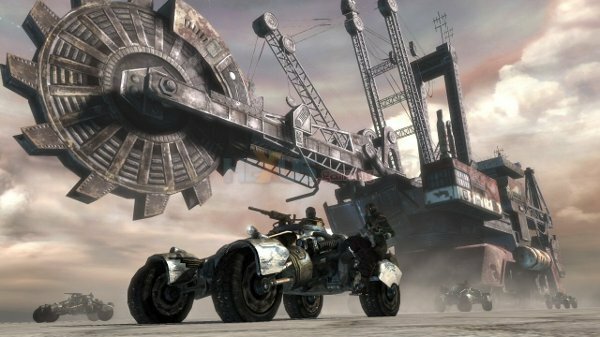 Eliot, because with Borderlands they haven't imitated anything; They've straight-up stolen elements from Diablo, Call of Duty, and numerous other successful games to make something different, if not better. The first few moments with Borderlands will make Call of Duty fans chuckle, as the controls are shamelessly pulled from that fine series. Everything from the way characters move when they sprint to how using the sights on weapons feels screams CoD, but hey, steal from the best, right? Gameplay itself is reminiscent of Diablo, with grinding for levels, distribution of skill points down one of several paths, and loot drops directly from the legendary PC franchise. Quests are handed out in the style of an MMO, and it's easy to get four or five sidequests done all at once before returning to the quest-giver and collecting some serious cash and XP bonuses. For some reason, the jumping physics in the game are identical to those found in Halo, making me wonder if the developers just threw that in as a joking acknowledgement to how readily they've copied the best elements from other games. 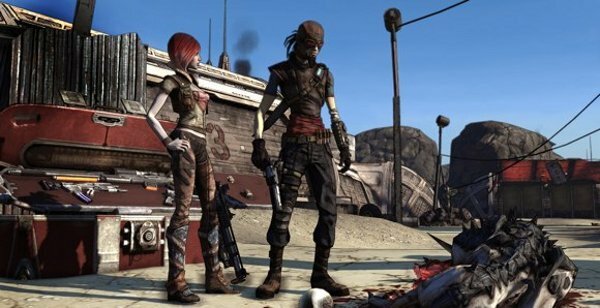 Borderlands does little in the way of providing any sort of story, but those who care about that are missing the point; this game is not about some pretentious tale with dialogue trees, lengthy cutscenes, and dead-eyed characters delivering lines that wouldn't be up to par in the lowest of low budget films: this game is about blowing stuff up with lots and lots of guns and grinding up levels. The guns in the game are "randomly generated" which means that they're created based upon a massive variety of variables, including weapon style, fire rate, reload speed, accuracy, damage, and any of a hundred or more special properties (like regenerating ammo, exploding bullets, poison damage, etc.) that weapons in the game can possess. Weapons cannot be upgraded, a feature that sounds bad at first, but in reality works as a driving force to make players explore and experiment with tons and tons of weaponry, enriching their overall experience with the game. A character's ability with the different categories of weapons increases with use, so using combat rifles a lot results in long term benefits like increased accuracy, damage, and reload speed with combat rifles. If I were to score this game based on fun factor alone, we'd be looking at an easy 10/10. Unfortunately, it seems like Borderlands just didn't get enough time with playtesters, as there are a dozen or so small issues in the game that slightly sour the overall experience. The vehicles are a bit too lightweight, and feel a little too much like plastic, if that makes any sense. The game makes you go into a menu to use a health pack, and that isn't an issue at all later into the game once you have multiple methods for automatic health regeneration, but towards the beginning it is pretty annoying. Textures take forever to pop in fully once players enter a new area and the frame rate can during large battles. Enemy A.I. is absolutely abysmal. Almost every enemy in the game runs straight at you upon seeing you, and the ones who don't are likely to not notice your presence until you're mere feet from them. The environments are brown and dull, despite the fact that the gorgeous cel-shaded graphics would look fantastic in a lush setting. The giant rocks that litter the levels in the game cause players to glitch around randomly every single time they are jumped on, but I never got completely stuck because of them. In some missions (especially the "Scavenger" quests), the waypoints that lead players to their mission destination are completely inaccurate, leading to much confusion and a trip or two to an online message board to figure things out. There is no system for trading, so players must drop items on the ground and simply trust each other if they want to trade weapons or other items. This could potentially lead to really, really annoying online griefing from punks who steal items and run away, but I never encountered the problem in my own experience with the game. The in-game shops almost never have anything that any player would want to buy, so money can and will pile up in useless heaps, especially towards the end of the game. For every small thing that Borderlands screws up, it offers up an innovative feature that's both practical and brave in concept. Vehicle depots are located all over the place, and players can spawn a custom vehicle and then teleport to either the driver seat or gunner seat from the same easily accessible station. There are also devices that allow players to fast-travel to any area in the game, which is an absolute Godsend due to the massive nature of nearly every area. Players can re-spec their allotted skill points at any point in the game for an extremely small fee, allowing experimentation and quick adjustments to created characters that would have otherwise been locked into an upgrade path that may or may not have been desirable. There are no difficulty options, which means that every player is given the same challenge. No one gets to act all high and mighty because they wasted 200 hours of their life beating the game on "insane" difficulty, which I personally appreciate. Getting killed in one of the frantically-paced battles doesn't mean death, as killing an enemy while downed earns players a "second wind," which brings the lucky character back to his/her feet and back into the fight, albeit with reduced health. Experience and money are shared equally among team members in cooperative play, but ammo is free game, which causes a mad, competitive rush for ammo drops, which doesn't really fit in well with the otherwise co-op specialized game features. It's obvious that the developers of Borderlands want you to play their game in co-op. Every character class includes multiple skills in their respective skill trees that could potentially benefit a whole team (such as added team experience for criticals). The main menu includes the standard single player, credits, and options features, but three separate ways to play cooperatively are listed as well, including splitscreen, Xbox Live, and system link (the best way to play any game cooperatively). Joining online games is easy and extremely customizable, and hosting one's own game is an interesting experience, as the game will play just like it would in single player, but with random guys dropping in and helping you out whenever they please. I played through most of the game as a hunter class character using system link with a friend of mine, who also used a hunter. While solo play was rewarding and fun, I found two-player co-op to be the most enjoyable way to play Borderlands, as three or four player co-op just gets a little bit too frantic at times. Borderlands is a hodgepodge of ideas and gaming mechanics, but somehow it managed to compile the sum of its parts into one truly fun experience, especially if played in multiplayer. There are plenty of minor flaws that sully the game, but the pure fun factor of completing quests, leveling up your character, and shooting any of the "bazillion" unique guns in the game makes up for any problems. Borderlands is a lengthy game (30+ hours, in fact) so those who purchase it will likely have it spinning in their disc trays for a long time, and I can almost promise that they'll be extremely happy consumers.